Sometimes a company does so well that it even surprises itself. This is what happened with Apple in Q1 2015. 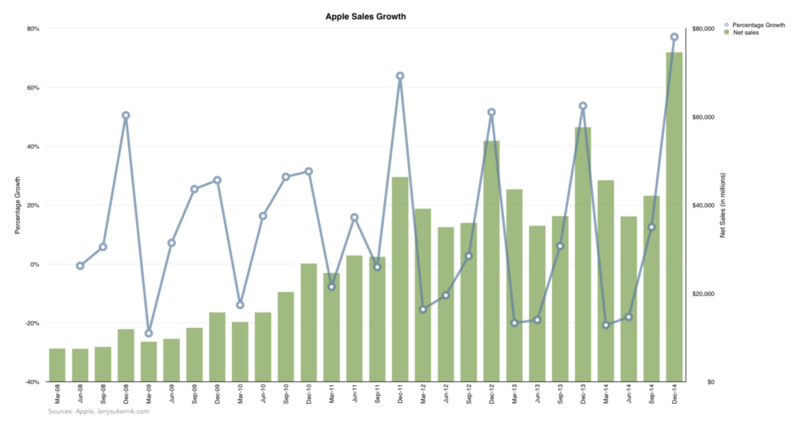 In three months (October, November, and December), Apple made $74.6B in net sales. The earnings were so good, in fact, that they exceeded the expectations of even the most bullish analysts. Below is a chart from Philip DeWitt of Fortune that summarizes analyst predictions prior to the posting of the results. Apple also posted the largest corporate quarterly earnings of all time (Fannie Mae still tops the list, but it's government sponsored and thus disqualified from this contest). Here's a nice chart from Wikipedia that puts Apple earnings in perspective. Apple is competing only with Oil and Gas companies which are in an industry of their own. 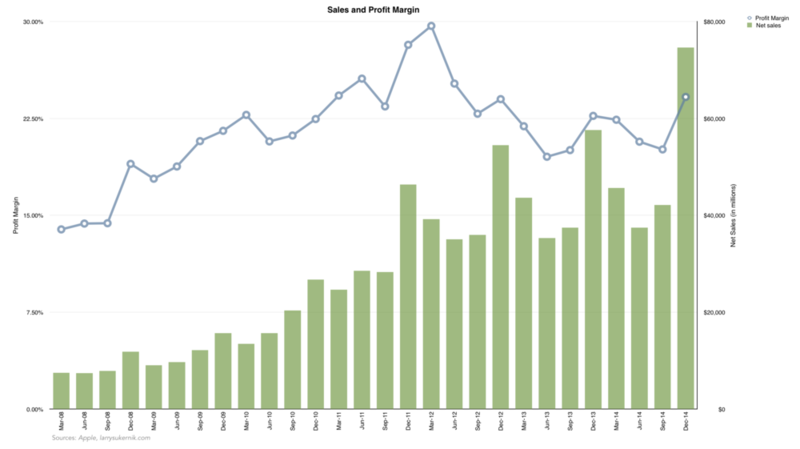 Now that we've established the astronomical scale of Apple's 1Q 2015 results, let's make my Accounting degree useful and jump into the financial data, starting with net sales. As mentioned earlier, net sales in 1Q 2015 were $74.6B (+77% sequentially, +30% YoY). 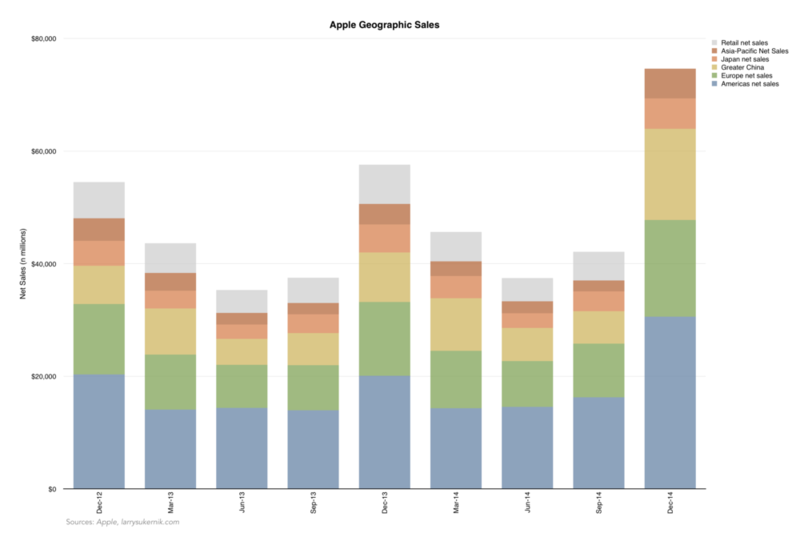 This chart is great because it shows just how seasonal Apple's sales truly were in the past few years. Every December, sales spike in terms of dollar and percentage growth, plummeting precipitously in the March quarter. They then rise slowly in June, continue rising into September, and reach their apex again in December. Many analysts have written that Apple's gross margin's will decrease in the future, due to competitive pressures from the low end market. While it's true that margins haven't exceeded 40% since September 2012, they haven't exactly ebbed either. As the chart above shows, gross margins were on the decline from March 2012 - June 2013, but have since been either stable or slightly increasing. Apple is not the type of company that deeply and truly cares about margins - Apple cares about the product. For that reason, I don't think there is much to be said here. In some periods margins will rise, in some, they'll fall. That said, I doubt margins will ever fall below 35%. Premium brands require premium materials. Continuing our financial analysis, let's now turn to the average selling price (ASP) of Macs, iPhones, and iPads. 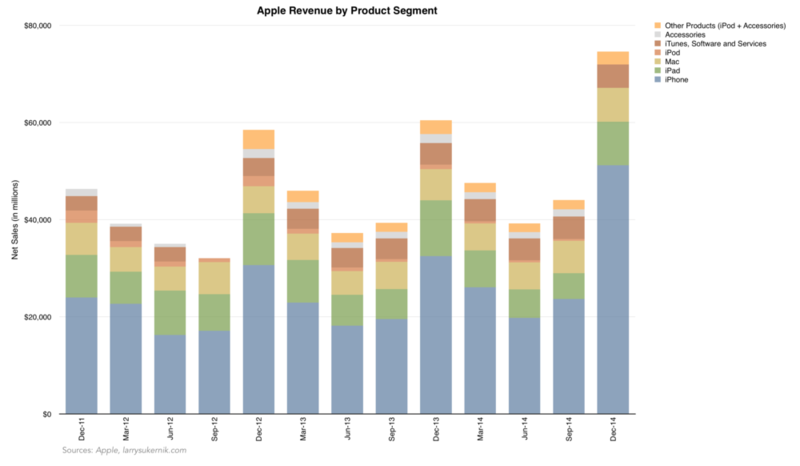 (For the unaware reader, ASP is calculated as Product Revenues / Product Unit Sales). You would think that PCs are going through tough times, and you would be right. Industry sales are decreasing, and so are the prices manufacturers can charge. Since Apple competes on differentiating itself through hardware and software, however, the company is somewhat insulated from the overall PC market woes. Mac ASP's have remained steady in the past few years, settling on $1,258 (+5% sequentially) in 1Q 2015. It's likely Mac ASPs will stay within the $1,100 - $1,300 range for the next few years. iPhone ASPs went up to $687 (+14% sequentially) in 1Q 2015 for two main reasons. The first reason is due to Apple's new iPhone storage structure, offering phones in the 16/64/128GB capacities. Going from 16GB > 64GB and from 64GB > 128 GB costs the consumer an extra $100, but that's not what it costs Apple. Lots of easy money was made here, but the long-term ramifications of such pricing tiers is questionable. Reason two for the increased ASPs is the introduction of the iPhone 6+, which sells for $100 higher than the iPhone 6 and all previous iPhone models. Just so you could see how expensive an iPhone can get (and by how much it can boost ASPs), a 128GB iPhone 6+ retails for $949 unsubsidized. How much more do you think it costs Apple to make than a regular iPhone 6? Answer: not much. For many reasons, iPad ASPs have been on a steady decline. The average selling price of an iPad today is just $419 (-3% sequentially). People just aren't willing to pay out of pocket for tablets. I would wager much more money is made (on average) on iPad accessories and apps than on the iPhone counterparts, which makes the ASP decrease a bit of a moot point. The iPad Pro could change this. During the investor call, Tim Cook made a slight reference that iPads are great in enterprise, and the recent partnership with IBM can further strengthen the iPad in enterprise. If an iPad Pro is indeed a real product, and if enterprises begin purchasing them, ASPs will certainly increase. Apple is no longer reporting iPod unit sales or revenues, since the product is becoming more irrelevant by the second. I'm honestly surprised it took this long for Apple to stop giving us breakdowns. Average iPod revenues over the past year have been a measly $572M per quarter (which is negligible for a company as large as Apple). Sales revenues are also no longer broken down for accessories. My thoughts on why are below. There is a new product-level category Apple introduced this quarter, mysteriously called Other Products. According to Apple's 10-Q filing, this category includes "sales of iPod, Apple TV, Beats Electronics and Apple-branded and third-party accessories". In short, Other Products is the combination of the aforementioned product-level categories iPod and Accessories, both of which were killed of this quarter. While this may seem like a small change, I believe it foreshadows the Apple Watch accessory market. A huge selling point for the upcoming Apple Watch are the heterogeneous bands you can wear with it. Disclosing the revenues from these watch accessories may not be in Apple's best interest because the competition may learn far too much from it. Also gone is the Retail Sales operating segment. Instead, retail sales are now distributed by geographic region (Americas, Europe, Greater China, Japan, and Asia-Pacific). The driver for this change is again the Apple Watch. Unlike most of Apple's other products, the Watch will be a product that will need to be tried on and physically played with before purchase. This is because the Watch is not only a tech device, but also a fashion accessory (would you buy an expensive watch online without first seeing it in person?). Continuing with this line of reasoning, the Apple Watch will be sold mostly through Apple retail stores (I think luxury boutiques and outlets will carry it as well, though). Disclosing retail sales would provide too much data into Watch sales, and that is likely the reason for the disappearance of the retail segment. Postscript: I'm doing a new thing starting with this post, and will be including a gallery of all my charts. They're free for you to peruse and share.